Be it through divine predetermination, universal karma or plain old coincidence, fate is an inevitability. And it was afoot when, in 2007, Cameron Tharp and Kristi Rockwell met at a business social in Maui, Hawaii. Finding themselves adrift in a sea of formulaic conversations typical of corporate networking events, the pair simultaneously smacked into a mirror. Quickly, Tharp and Rockwell would learn that each is from Alabama and that, as kids, both had vacationed with their families on the Emerald Coast. And, as it happened, both had ailing parents back home when the two were in Hawaii, making for distracted island stays. The two easily could have stopped at exchanging business cards and trite “It’s a small world” observations. But, that day, Rockwell and Tharp realized they had been placed upon a path. Faith, not fate, would be the trailblazer. Back home, they stayed in touch and supported one another while caring for their parents. A friendship developed, and Rockwell and Tharp discovered one another’s creative side. Both knew something about running a business, and both were keen on boots. It wasn’t long before idle sketches came to life. “The original boots we produced were a heavily embroidered, knee-high design,” recalled Tharp. Seemingly overnight, one pair became 100. Soon, the duo discovered that their luxe, leather designs seamlessly translated to handbags, and hundreds of boutiques in the United States and beyond began clamoring for their products. Still, the only place in the world where one can view their full collection is at Rockwell Tharp, the company’s flagship store at The Village of Baytowne Wharf in Sandestin. Even their website, rockwelltharp.com, doesn’t reveal the entire stock. “Sandestin is our home, and we feel like Baytowne perfectly encapsulates the melting pot of our clientele,” Tharp said. Kathie Lee Gifford featured two pairs of Rockwell Tharp boots on the “Today” show in 2012. Sales of those designs benefitted Childhelp, a non-profit that Gifford represents. Rock star Jim Peterik of Survivor is fond of his grey, leopard-print Rockwell Tharp boots. Tharp and Rockwell also spend time with the members of Heart and Quiet Riot. From a sleek, black pair of crocodile cowboy boots, to an over-the-knee stiletto embellished with pastel brocade and bold embroidery, it’s hard not to feel spectacular in a custom pair of Rockwell Tharps. “Eye-catching” is an understatement. Past designs have dazzled with Swarovski crystals and signature Savani textiles that ensure no two ladies own the same pair. Even the simplest of designs boasts more than meets the eye. Solid ankle booties are stitched with durable, dignified, stingray leather. The selection process is no easy feat, prompting Rockwell and Tharp to biannually circumnavigate the globe. At this writing, they’re in Thailand visiting one of their leather factories — and noshing on Tharp’s favorite Thai dish, green curry. 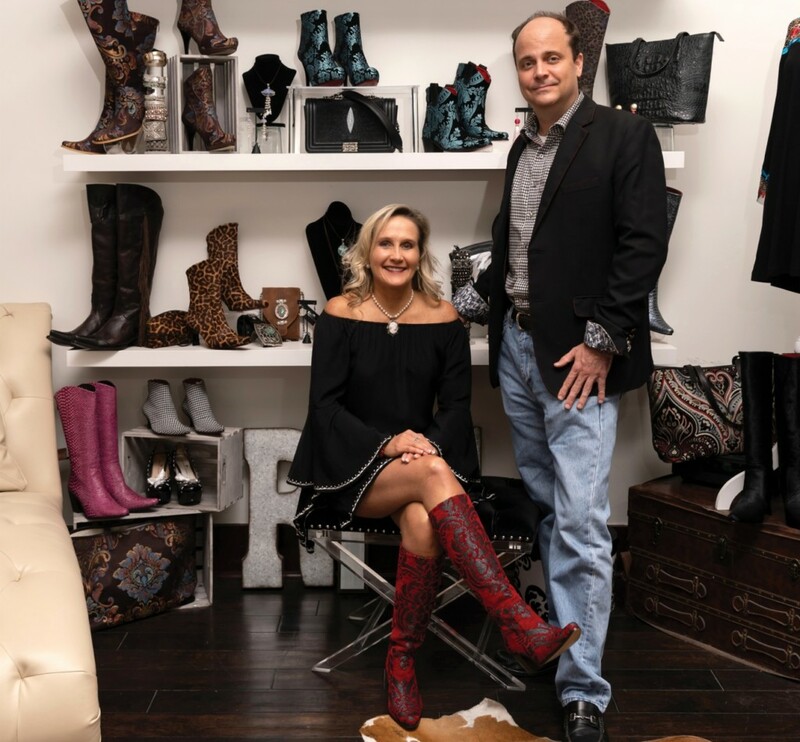 Though the trip will yield a more solid idea of what their winter collection will entail, Tharp said they’re keeping an eye out for trendy python leather, bright colors, heavy embroidery and statement patterns. 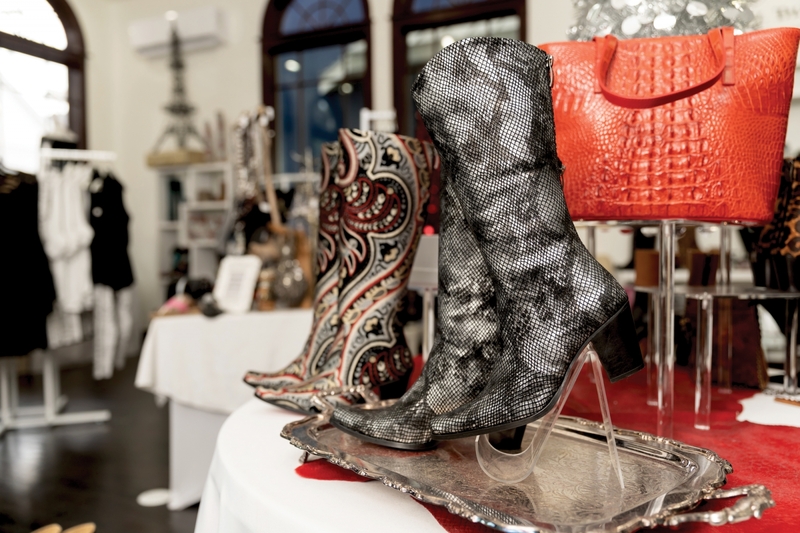 Rockwell, a southern belle herself, often couples her boots with the array of apparel available in the Baytowne store. While some customers may be overwhelmed by the eccentric patterns of a boot, Rockwell and Tharp are always excited to showcase how their standout footwear can make an outfit pop.